Amada PEGA 304040 30 Ton 40-Station CNC Turret Punch Press s/n AL440405 w/ Amada-Fanuc-P (System 6M) Controls, 40-Station Turret, Sheet Repositioner. Amada OCTO-334 30 Ton 8-Station CNC Punch Press s/n AL340012 w/ Amada-Fanuc-O (Series 6M) Controls, Manual Sheet Repositioner, 26” x 98” Ball Top Table, 21 ¾” x 47” Drop-Down Front Support Table. 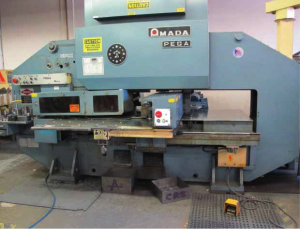 1995 Amada RG-35S 35 Ton x 48” CNC Press Brake s/n 356291 w/ Amada NC9-EX II Controls, 47.3” Table Length, 49.3” Max Bend Length, 40.2” Between Uprights, 7.88” Throat, 3.94” Stroke, 14.58” Open Height. DiAcro mdl. 14-72 14GA x 72” Press Brake s/n 6601183812 w/ Manual Backgage, 72” Bed Length, 9 1/8” Throat, 61 7/8” Between Uprights. Wysong mdl. 1052 10GA x 52” Power Shear s/n P58-436 w/ Dial Controlled Back Gaging, 59” Squaring Arm, Front Material Supports. Strippit Custom 18/30 Fabrication Punch Press s/n 66992983 w/ Nibble/Single Punch Modes, Fence System. Haeger HP6-B 6 Ton x 18” Hardware Insertion Press s/n 1499 w/ Foot Control, Tooling. Haeger HP6-C 6 Ton x 18” Hardware Insertion Press s/n 1985 w/ Foot Control, Tooling. Strippit mdl. 250 ECONO 24” Belt Grainer s/n 9000283252 w/ Barrel Style Dust Collector. Bridgeport Vertical Mill w/ Sterling DRO, 1.5Hp Motor, 60-4200 Dial Change RPM, Chrome Ways, 9” x 48” Table. Bridgeport Vertical Mill s/n 49895 w/ 1Hp Motor, 80-2720 RPM, 8-Speeds, 9” x 42” Table. Boyar Schultz Challenger H612 6” x 12” Surface Grinder s/n 27622 w/ Sony DRO, Walker 6” x 12” Fine-Line Electromagnetic Chuck. Miller Syncrowave 351 CC-AC/DC Arc Welding Power Source s/n KF867369 w/ Bernard Cooler. Western Arctronics 50kVA Spot Welder s/n GA267 w/ 30” Arms, Bernard Cooler. 30” x 48” Welding Table. W.F. Wells 7” Horizontal Band Saw w/ Manual Clamping, 4-Speeds. Central Pneumatic Dry Blast Cabinet. Torit mdl. 64 Dust Collector s/n H4972. 2007 Kaeser AS20T Sigma 20Hp Rotary Air Compressor s/n 3114 w/ Sigma Controls, 92 CFM @ 125 PSIG. Kaeser SK26 20Hp Rotary Air Compressor s/n 0269869 w/ 92 CFM @ 110 PSIG. Pneumatech AD-75 Refrigerated Air Dryer s/n 9601-T122744-ST.
180 Gallon Air Storage Tank. Wilton Press Brake Dies (For Amada). Mitutoyo and Starrett 24” Dial Height Gages. Starrett Crystal Pink 36” x 36” x 6” Grade “A” Granite Surface Plate w/ Rolling Stand. Starrett Crystal Pink 18” x 24” x 4” Granite Surface Plate. 2000 Chevrolet Express 2500 ¾” Ton Cargo Van Lisc# 6H56314 w/ 5.7L Vortec Gas Engine, Automatic Trans, AC, 123,891 Miles VIN# 1GCGG25R3Y1222079. 2000 Toyota Tacoma Extended Cab Step-Side Pickup Truck Lisc# 6H66963 w/ 2.4L Gas Engine, 5-Speed Manual Trans, AC, 218,229 Miles, VIN# 5TEVL52NXYZ686451. Towmotor mdl. 501 5000 Lb Cap LPG Forklift s/n 501610052 w/ 2-Stage Mast, 144” Lift Height, Cushion Tires.